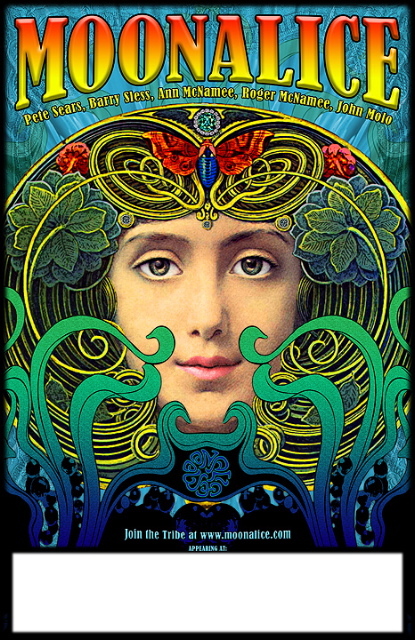 Welcome to the Moonalice Street Team! We want your help to get the word out on the upcoming 2012 Tour We’ve put together this Street Team Page with everything you need. You can sign up to help promote shows by going to the Request Promo Tab above. On the Digital Tools tab, you’ll find web banners, widgets, and videos that you can share online to help get the word out on the tour and the album. We need street team help with the upcoming Moonalice Tour. We would need you to hang posters in high traffic areas as well as pass out handbills at upcoming shows in your area over the next few weeks. Help promote the tour online by completeing tasks in the Online Mission tab. You can also find other tools to help spread the word in the Online Tools tab above. Report any work you've done to our site. Instructions on how to report are located in the How to Report tab above. Please keep track of all the work you do and save it to your desktop / excel doc (links and screen shots) so you can report it, and we can reward you! If you’re a member of a forum, you can post topics about Moonalice or use our banners as part of your signature! For blog owners and contributors, write articles about Moonalice and post our banner ads on the blog itself! On the Report Page, you will be able to upload screen shots, jpgs, etc.. of all of your work, and you can also put direct links to the sites where you have posted your banners. You will then receive “POINTS” for everything that you report to us. Convert photo to a .jpg, and upload to the Reporting Page!! Still need to make an account?